It's the quarter finals this week! There are five contestants left. After watching episode one I thought Heather was definitely headed to the final, but last week I was surprised to see her scrape through. David, who showed little promise early on, now looks like a reasonably strong contender. I've got to say that this week genuinely excites me. It's vintage and retro week - making the clothes we used to wear. 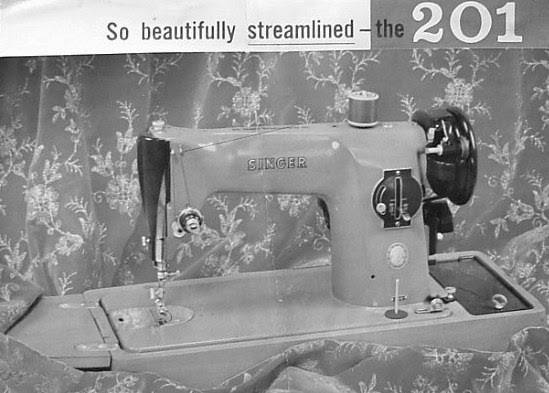 For me the most exciting part is that contestants get to sew on a classic Singer 201 machine. This amazing, sturdy machine was made from 1928-1963. Alex Askaroff has written about this machine on the Sewalot Site. 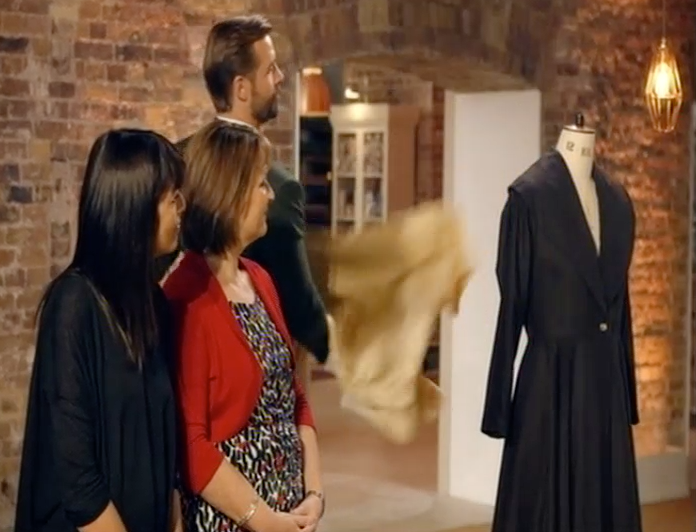 Alex worked with the Great British Sewing Bee to choose an iconic machine for this episode. This is a Singer 99X, which I inherited from my Nana. I don't know exactly when it was made, but it does have a reverse, which means it was made after 1949. It does straight stitches, forwards and backwards, and that's about it. This machine works beautifully, and I used it to make my flower girl dresses for our wedding, curtains for our first home and baby clothes for Olivia. 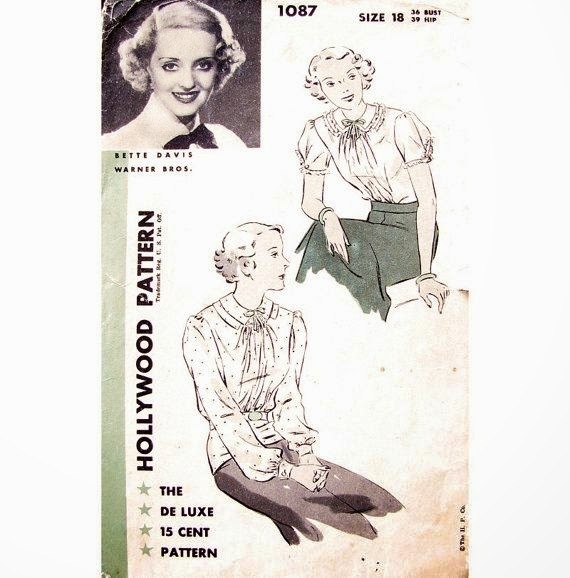 Sew a 1930s blouse from a vintage pattern (techniques include deciphering a vintage pattern, using a vintage sewing machine, sewing a placket closure, shirring) in 4 hours. If you'd like to read more about techniques for working with vintage patterns, Threads Magazine published an excellent article. There were two fabrics chosen that really stood out. I loved Chinelo's beautiful blue floral fabric. It was such a good choice for this challenge. I also liked David's blue and white spotty fabric. Deciphering the pattern was the first difficulty for contestants. I have to assume that home sewers back in the 1930s all knew what those little holes on the pattern meant, but it looked totally baffling to me. There also appeared to be limited instructions, and contestants had to use some common sense (like knowing to cut four pieces for the collar). The next difficulty was the shirring. All contestants seemed to know how to do shirring, but getting the placement right and the gathers tight enough gave contestants some headaches. David didn't sew his shirring wide enough, and ended up having to sew new stitching over the top. The placket seemed to give everyone the most trouble of all. Chinelo, Tamara and David all seemed baffled and Lynda was kind enough to show everyone how to get it done. Lynda was in a very chipper mood during this challenge, and seemed totally oblivious of the time. She chatted, gave help to other contestants and wasted time doing hand-sewn gathering. In the end her blouse was unfinished. Chinelo's good sleeves, gathers in the right place, collar even (but not sitting flat) and neat placket. Heather's beautifully flat collar, neat and centred shirring, and gathers sitting perfectly centred down front of blouse. Tamara's flat collar (although her shirring wasn't tight enough and there was a gap between the collars), OK placket with closure sewn on. Lynda's uneven collar, neat placket but no fastening sewn on. Her blouse was unfinished, and Patrick commented "you've made a feature of these pins throughout!" David's collar not sitting well, shirring off centre, placket not stitched down, and the level of finish not terrific. The results from 5th place are David, Lynda, Tamara, Chinelo in second, and Heather in first. Take a mens suit and transform it in 1.5 hours. 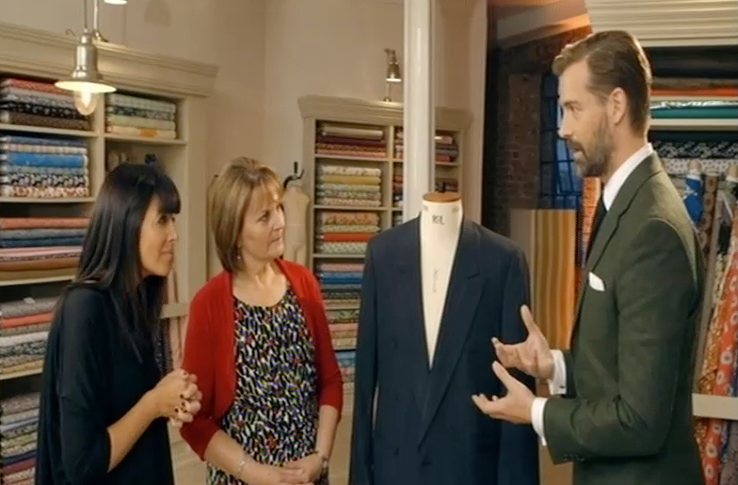 In the spirit of Make Do and Mend contestants were given a mens suit to refashion into an item of women's clothing. This week they were now allowed into the haberdashery for any extra items. Everything they wanted to use, had to be sourced from the suit (fabric, buttons, zip, etc). Chinelo decided to be very ambitious, and made a pencil dress. She started by cutting the fabric into pieces and creating her pattern from scratch. Heather made a very simple looking bustier with an asymetrical back. She used darting as a feature. Tamara turned her jacket backwards (she was aiming for a backwards tuxedo look) and cut out the sleeves and shoulders, used pleating and darts to shape the front, then trimmed the front with the jacket cuffs used to create ruffles. Lynda made a cute little a-line pinafore dress, and shared stories of her misbehaving at school. David made a halter neck top out of his jacket and used darts to shape it. He wanted to retain the look of a cut-down jacket. Chinelo's dress was ingenious and extremely well shaped. Heather's top was one of the simplest transformations, but it was well fitting and quite cleverly done. Tamara's top was a substantial pieces of re-engineering, but it is is just the suit jacket backwards with the sleeves and shoulders cut out. Lynda's pinafore dress was effective, neatly sewn, fits well, and was incredibly well done. David's top was neat, fits mannequin well, was a big transformation, but has retained a lot of the original jacket-ness. The results from 5th place are Tamara, David, Heather, Lynda in second and Chinelo in first. Sew an retro style overcoat, using old-fashioned tailoring techniques to fit a real model in 6.5 hours. Contestants were allowed to bring in their fabric pre-cut for this challenge. When I saw that the challenge was to make an overcoat in 6.5 hours, I was wondering how anyone would be finished in time. I've never attempted an overcoat, and I honestly think it would take me a week of solid sewing to do a good job. I liked the fact that this challenge was really ambitious. Overcoats are a hugely difficult piece of sewing. The fabric is heavy and there's lots of it. There's loads of neat tailoring required, and tricky reinforcing to ensure a really clean finish. Chinelo made a 1940's coat with a fitted bodice and flared skirt in a camel coloured fabric. She decided to be ambitious with this challenge, and had to cheat a little (using iron-on interfacing) to give herself enough time to finish. Heather made a 1953 swing coat with a draped collar, turn-back cuffs and patch pockets in red and black cashmere/wool fabric. Tamara made a 1967 coat with contrast lining, fitted princess seams, entire line waist and bound button holes in a bright yellow chunky weave wool fabric. This was the first complicated pattern her mum had ever attempted. One of the greatest difficulties for Tamara was that her loosely woven fabric was constantly falling apart, making it very difficult to handle. Lynda made a 1950s coat with a shawl collar and full skirt in a wool flannel. This was an emotional challenge for Lynda, who was inspired by her tailor mum. David made a 1940s police coat with a high collar, side pleats, breast pockets and original buttons in a VERY heavy wool fabric. David had done some research with the local heritage centre, and also obtained original buttons for his jacket. Unfortunately he had bought his fabric over the phone, and it was incredibly heavy and hard to work with, making this challenge even more difficult. Chinelo - There were a couple of problems with the jacket - the hem was a bit wavy (possibly caused by the straight grain not running down front of skirt), the front edge was lumpy and not sitting flat. On a positive note, her lining was beautiful, and the judges commented on her bagged out and under-stitched lining. nice shape and good draping. There was a lot of good work, but the details weren't perfect. Heather - Patrick was "a little sad, because it's so close to being a real knockout". Heather was let down by a few little details - the contrast fabric was showing under the front edge when it shouldn't, the hem was not done and the shoulders were uneven. The judges did note that the drape shawl was really effective. Tamara - The jacket fits well, the shoulders were good, buttons lined up nicely with bound buttonholes. There were some negative comments - the contrast fabric on collar was showing, the hems were chunky and shouldn't have been turned up double. Lynda - The collar sat nicely, the hem was level, the sleeves were nice and slim and finished at same point, darts were even, and there was a lovely invisible hem. Overall Lynda's overcoat was well fitted, well balanced and well executed. David - The sleeves were well done, had no puckers, but not perfect, the collar was sitting unevenly and needed a really good pressing. On a positive note the fit was really good. This was a tricky garment, and overall David did well. David - pattern challenge blouse was not good at all. Lynda - pattern challenge blouse was not finished. Tamara - suit refashion was the least well managed. I'm going to miss having David around next week. He was such a nice contestant. I liked his no-nonsense style. Nearly every week he has struggled with the reinvention challenge, and he has come close to elimination week after week. It was so nice to see how much he improved over the weeks. There weren't a lot of hints about the challenges next week. All that's revealed is that contestants will have to sew a dress with no pattern (surely a doddle for Chinelo? ), and that everyone will find it difficult. I'm definitely looking forward to next Tuesday night. The Thrifty Stitcher - Claire-Louise Hardie is the Sewing Producer for The Great British Sewing Bee, and usually does posts about the patterns used in the first challenge on each episode, and also has some nice posts about techniques used. 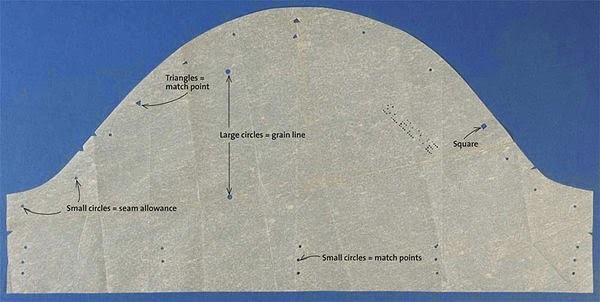 She has posted a great article on grading vintage patterns written by Alana from Lazy Stitching. Stitch Craft Create - Jen write a short recap each week. The Sewing Directory - each week an episode recap is posted, along with loads of useful links to patterns and techniques. There is also an archive of recaps from Season 1. Thanks so much for all of this wonderful information. I'm in the USA and the 6th episode is impossible to find. I have to know what happens in each episode. I'm glad it was useful for you. It's nice to know there's someone out there reading it!